So I’ve been giving myself a gradual pamper over the past two days. I started on Sunday by having a really nice long shower. I gave myself a thorough brush all over first using my body brush from Body Shop, once I was all brushed I applied Aromatherapy & Associates Revive Morning Bath & Shower oil – I checked and you can just add it to bath water or apply it before showering (it’s empty in the picture unfortunately!). I have a sample of L’Oreal Elvive Extraordinary oil, so I rinsed my hair and popped this on. After I washed, I rinsed the hair oil out and shampooed and conditioned my hair as normal. I have a large packet from Sanctuary of their Salt Scrub. This is quite a coarse scrub but it has oils in it as well. So between the Revive oil and the oils from the salt scrub my skin felt rather fabulous! Today has been face mask-tasic! My skin is a wee bit unhappy, I’ve been a bit lazy with my face mask routine, so it’s in need of a good clean. 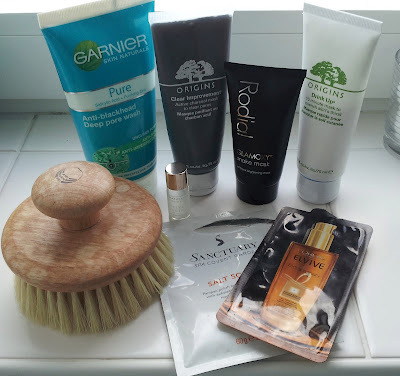 So out came the Garnier Deep pore wash, this is slightly coarse face wash. Then I applied Rodial Glamoxy mask over my chin and cheeks – these are my problem areas at the minute and needed the most attention. Once that had dried and I had the satisfaction of peeling it off, I rinsed my face and then applied Origins Clear Improvements mask. My skin felt really clean and soft after both of those but slightly dry, unsurprisingly! So I applied Origins 10 minute Drink Up mask and used cotton pads to remove it. My skin feels really clean and soft and rather lovely now.